French inflation accelerated more than many economists anticipated in March, reaching the fastest pace in at least 12 years and underscoring the European Central Bank's reluctance to cut interest rates. Consumer prices climbed by an annual 3.5 percent, up from a rate of 3.2 percent in February, based on European Union- harmonized methods, Insee, the national statistics bureau, said today in Paris. That's the fastest pace since 1996, when Insee began reporting the data, and matched the euro region's rate. Prices increased 0.8 percent from February, which was also the biggest monthly gain on record. 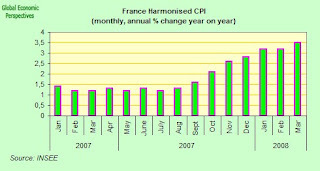 French energy prices increased 2.7 percent on the month and 12.7 percent from a year earlier. Food costs rose 0.4 percent from February and 5.3 percent on the year, today's report showed. Services such as health care and transport added 0.2 percent in March from the previous month, and the cost of manufactured goods climbed 1.2 percent, Insee said. ECB policy makers including Yves Mersch, Juergen Stark and Axel Weber have rebuffed a call by the International Monetary Fund to follow the U.S. Federal Reserve and the Bank of England in cutting rates to bolster economic growth. The Frankfurt-based ECB last week left its benchmark rate at a six-year high of 4 percent, even as a looming U.S. recession, record oil prices and the euro appreciation threaten to choke economic expansion. Following the news investors raised bets that the ECB would stand pat through 2008. The yield on December interest-rate futures rose to 4.18 percent from 4.14 percent yesterday.